A beautiful costumed woman enters into the precinct of the Chicago Police Department and instantly draws the attention of all of the male officers. Alex Wilde confronts this new arrival and learns that she is Dart, a new super-cop that had been recruited from Detroit where she been fighting crime for years now. Her arrival was kept a secret by Captain Stewart in case anything suspicious was going on. An alarm klaxon sounds and Alex explains that Dragon is out of town so all hell has broken loose. Dragon has been loaned out to New York City once more and is frustrated by it, knowing that his own city now goes undefended. It seems that elderly women are being abducted by what has been identified as some kind of gargoyle and it needs to be located and destroyed. Dragon stalks the rooftops and finds himself attacked by the Teenage Mutant Ninja Turtles who wrongly mistook him for the gargoyle. The Turtles are held off by their intended victim before they realise their mistake and apologise to Dragon, now recognising him. They had intended to stalk and defeat the gargoyle themselves and so their assistance is welcomed by Dragon. It is not long before the creature reveals itself and battles against all five of the heroes. Whilst the Turtles keep the monster occupied, Dragon gets into a position for him to attack. He leaps up and with a single punch he destroys the gargoyle. He questions how such a being could exist and it is suggested by his new allies that magic was involved. This reason is dismissed by Dragon, unaware that the villainess Virago watches on. It had been her mystical abilities that had animated the gargoyle and she now slinks away into the shadows. Dragon has no interest in investigating further as he is eager to head for home. 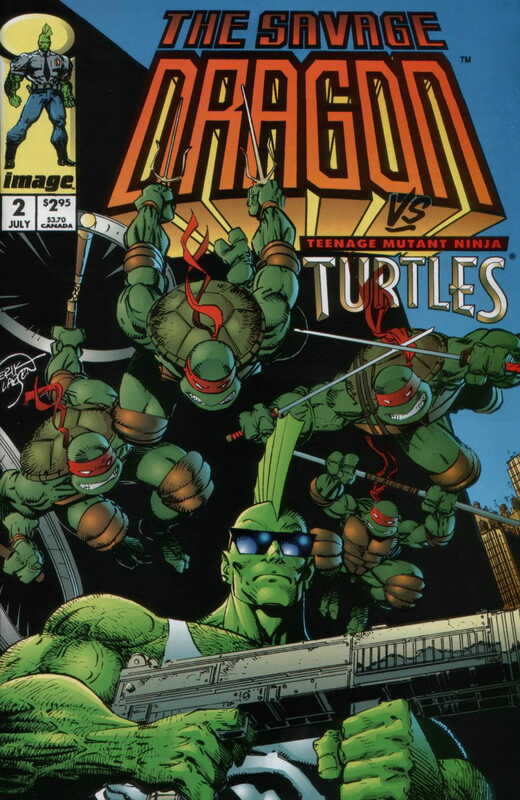 NOTE: The cover to this issue minus Dragon is shown in the movie Turtles Forever, during the scene where the Utrom Shredder discovers the Teenage Mutant Ninja Multiverse. 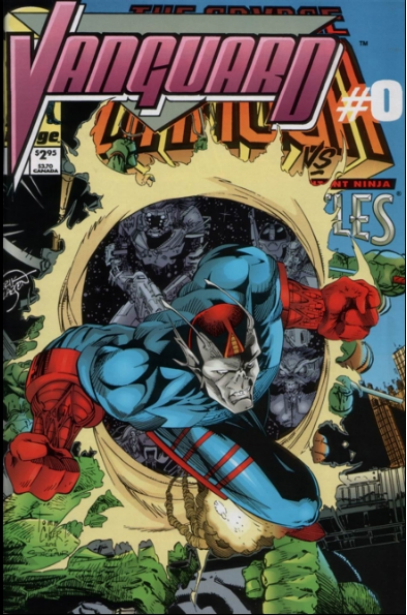 While the Dragon is away on a mission in Sacramento, California extraditing a villain called DeathJob, the super-freak population seek to take advantage of this situation in Chicago. Inferno from the Vicious Circle is scaring away people at a factory which draws the attention of the vigilante Star. He takes the fight to the villain as flames begin to engulf the entire building. Inferno gets a number of stars fired into his body which only goes to enrage him further, causing the fire to blaze out of control. 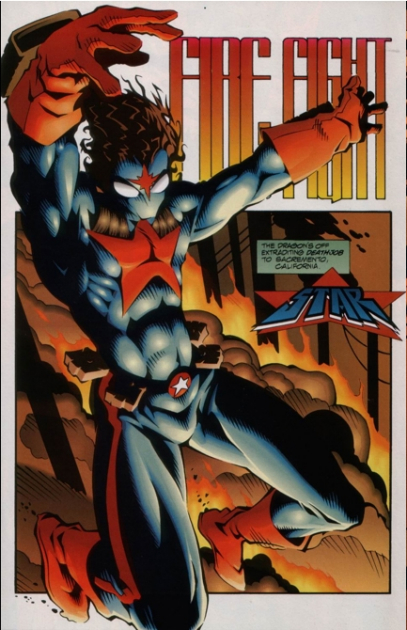 He then sets Star’s trademark hair alight and burns it all off but Inferno starts to get over-confident. The villain leaps at his opponent but misses, colliding with a gas container that promptly explodes and consumes him. The exhausted Star emerges from the flames before collapsing to the ground to recover. NOTE: This story takes places right before the WILDSTAR: SKY ZERO miniseries. On a hostile alien planet, a young warrior named Vanguard kills his way into an enemy citadel where he fights against a whole host of creatures. As he progresses through this fortress, Vanguard starts to recognise some of his foes as monsters from fiction. He soon gets attacked by the alien Pitt before a number of familiar superheroes begin to join the fray. This is the final straw and Vanguard calls out for his partner Wally to halt events. It is revealed that all of this carnage had taken place inside a holographic training facility aboard a spaceship that is orbiting Earth. Vanguard is a soldier for his people’s army and he has been assigned the unenviable task of monitoring the planet for any possible invasion. The Tyrrus Combine are his race’s bitter enemies and Vanguard has been charged with keeping them from this planet, a situation that is made frustrating because Earth is so remote that its presence was only discovered by an accident and the chances of an attack are tiny.